Show your Local Library Love this February! Did you know that February is Library Lovers Month? Well, it sure is! 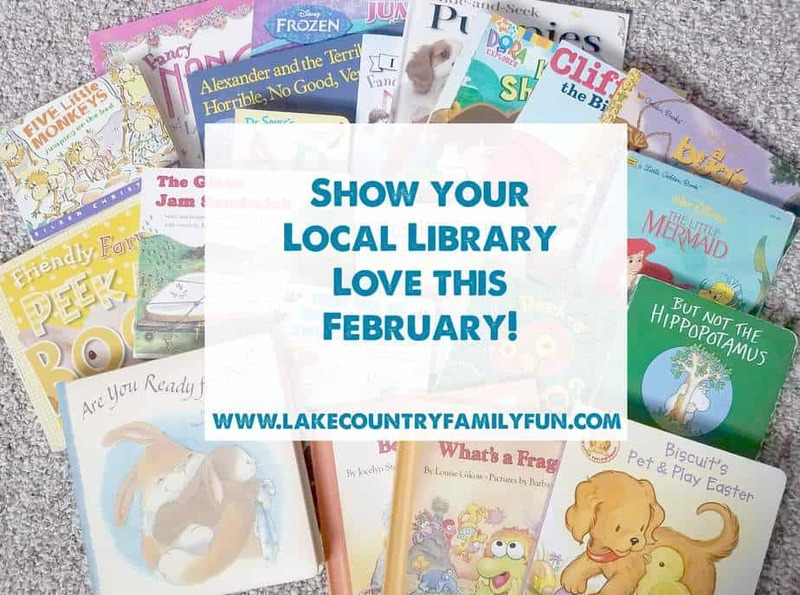 And it is quite obvious that Lake Country Family Fun LOVES libraries, not just in February, but all year long. I mean, have you seen our Events Calendar? 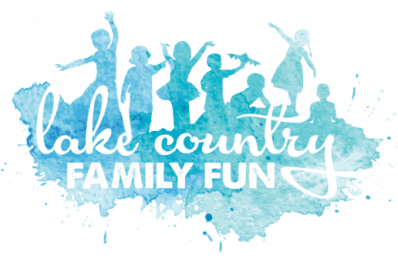 It is chock-full of local library storytimes and fun family activities throughout Waukesha County. How do you show your local library love? Thinking back to when I had my first child, taking her to storytime at the Oconomowoc Public Library was a weekly routine that we did not dare miss! We have so many fun memories and met some of our best friends there, too. Now, with my youngest as my sidekick, we enjoy the Oconomowoc Public Library’s storytime that is held at a local nursing home and assisted living center once a month. In light of the February’s theme, I have asked some of our local librarians to share their favorite library event for this month for you to mark on your calendar and enjoy. I also asked them to share a “fun fact” about themselves relating to their library or reading or a fun fact relating to their library in general. I really enjoyed speaking and writing with our area Children’s Librarians. They are so passionate about the work they do with their programs and children in their communities. I also cannot wait to take my 3 year old sidekick around and meet more of these amazing ladies and their libraries in person. The hope of this piece is that you will grab your little or big ones and explore your local library a little bit more, or better yet, explore a few libraries in the area and experience what makes each library unique. Spotlight Event: Come to Story time hour on Wednesday morning, February 15 from 10:00 am to 11:00 for Big Bend Public Library’s Valentine’s Party. Your children will love this fun, festive theme. Moms will be bringing snacks in and doing a craft. Fun Fact: Big Bend Village Library’s storyteller, Cheri, has been doing storytime for over 5 years. She is also an occupational therapist with a specialty in child development. Added to her resume is also that she has been selling antiques for 30 years and recently became an appraiser. Come say hi! Spotlight Event: The Brookfield Public Library has their Kids for Kids concert. This concert is presented by the Wisconsin Conservatory of Music and featuring Suzuki. Please join on Saturday, February 4, at 2:00pm! Fun Fact: The Brookfield Public Library is redesigning their Children’s board book area with a fresh new look! The work started on January 30 – check it out this month! Spotlight Event: Come to the Butler Public Library for their Valentine’s party. There is a $1 donation suggested, which goes to the St. Agnes Food Pantry. There will be a chocolate fountain, treats, crafts, activities and games. It’s an after hours event, so don’t miss it! Mark your calendars for Friday, February 10 from 6-7:30 pm. Fun Fact: Lisa not only works at the Butler Public Library, but she is also the “Youth Services Librarian II” or the young adult librarian at Town Hall in North Lake. Lisa also calls herself a “book addict” and “veracious reader”. Stop in and say hi! Spotlight Event: Come see a PG rated Movie on February 27 at 3:30 pm. Snacks will be provided. The movie is a popular children’s animated movie about birds, made in 2016. Guess what it is, and then come see if you are correct! Spotlight Event: Bring your child to Lego Club on February 16 at the Elm Grove Public Library. This is an after school activity for children in elementary school from grades Kindergarten through 5th grade. The event is from 3:30 pm – 4:30 pm, followed by a high school robotics demonstration from 4:30 pm – 6:oo pm. Spotlight Event: Come to an indoor drive-in movie! Families with young children are invited to come on Saturday, February 18 from 10 am to 11:30 to make their own cars. The library will be providing boxes with basic building supplies to make the cars. Afterwards, children are welcomed to watch a short film while sitting in their car. Registration is required to ensure there are enough boxes and supplies for everyone. Fun Fact: Kris has been at the Menomonee Falls Public Library since 1975. She enjoys residing and being an active member of a community for that long of a time to see her library families around town, such as the grocery store, and watch them grown and make their own families. In fact, one of the children that families around town, grocery store, watched them grow. Kids in story hour of kids from back then. One of doctors had in children’s storytime earlier in career. Spotlight Event: Sunset Playhouse Children’s Theater is coming to the Mukwonago Public Library to do a musical theater production of “Goodnight LuLu”. “Goodnight Lulu” is a book by author, Paulette Bogan. This book is out of print, so come enjoy it live! Dress your children in their pajamas and come to the Mukwonago Public Library on Thursday, February 16 at 6:30 pm. What a fun free night! Fun Fact: The Mukwonago Public Library is currently investigating and plans to launch a mobile makers space very soon. This will be a space for children and students to come and check out different little devices (code-a-pillar and ozobox) for kids to learn about technology. Jane is excited about the “wonder of it all”. Children can even learn coding from some of the devices. This mobile makers space hopes to join th Mukwonago Public Library on Wednesday afternoons and early evenings when the children have early release days. Spotlight Event: Abby had a hard time choosing just one event, but she was very excited to discuss their Family Picturebook Brunch event coming up on February 18th. They will be giving away 20 copies of the book to families that attend. The book for this month is “You will Be My Friend” by Peter Brown. Abby loves this book. At the brunch, they will do a short story time and have dancing and movement. Don’t forget the brunch part; there will be donuts, orange juice, and coffee 🙂 The children will get to do a lot of extension relating activities. The age range for the event is babies to older siblings, aged 12-13 years old and their families. During the weekday storytimes, Abby generally only sees the youngest or younger sibling(s) and one caretaker/parent, but at this event, she relayed it is so “cute and sweet to see the whole family and older school aged siblings. It’s like the kid version of “take your child to work day”.” Abby relayed that this event usually has a great turn out, and if families come every month, they will have 12 new picture books by the end of the year for FREE. This event is sponsored by their Friends of the Library group, who are very generous. Spotlight Event: The New Berlin Public Library Youth Services Department would like to highlight their upcoming “Developing Your Child’s Reading Skills” event coming up on Saturday, February 25, at 1:00 pm. 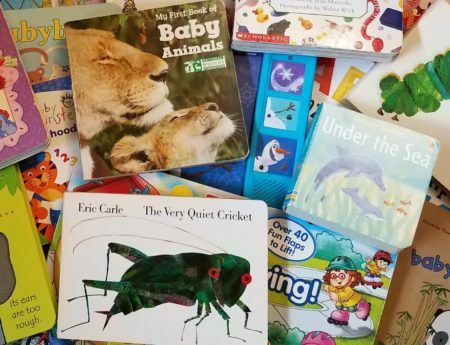 This free workshop, geared for parents, is presented by the Penfield Children’s Center and will discuss the importance of reading to and with your child. Identifying and selecting age-appropriate books and tips for raising a reader will also be presented. Registration is required for this event. Children are welcome to attend with their parents; puzzles and coloring sheets will be available during the program. Fun fact: The New Berlin Public Library participates in the 1000 Books Before Kindergarten program which encourages parents to read with their child, helping to develop important pre-reading skills that provide a solid foundation for learning success. 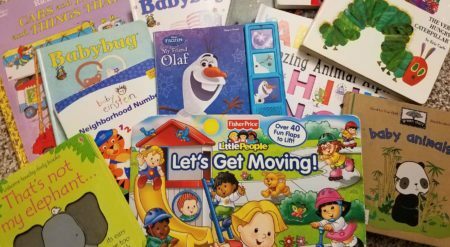 To date, their library has had 50 families reach that 1000 book milestone! Yay!! Spotlight Event: Erin chose to spotlight the Town Hall Library’s tween/teen event: Minute to Win It. Children ages 10 and up are invited to come and complete different challenges in less than a minute. This event will be held on February 15 from 3 to 4 pm in the lower level children’s area. Spotlight Event: Jenny, too, had a difficult time picking just one event, so I picked one out of three that she discussed. For Families, the Pewaukee Public Library has “Science Saturday” on February 4th from 1:00 to 3:00. This is a drop in event, so registration is not necessary. They will be doing some fun experiments with chemistry — making slime and “silly putty.” Sounds like a great time! Fun Fact: When Jenny was a child, her mom would take her to their area library, and Jenny would sit in the car for hours and read all the books before getting out of the car. Then, she would go in the house and let her mom know that they could go back for more books. “That sense of joy and discovery at the library stayed with me, obviously!” So happy it did, Jenny! Spotlight Event: Valerie wanted to highlight all their great programs, but she was most excited about their “Doggy Tails” program, where children can sign up to read to a community dog, Dakota. This event occurs on the 2nd and 4th Thursdays of the month (February 9 and 23). Children must call to register a time slot. Fun fact: The Pauline Haass Public Library is known for having a lot of interactive items and areas in their library. They have their very own fairy tale cottage that one can visit beginning in February. They change themes about three times a year. For February, they will have a new Storyland theme. There will be the fairy tale cottage, as well as 3 little beds for the 3 bears, a goldilocks doll, and more! Spotlight Event: Kerry chose to highlight Waukesha Public Library’s Little Sweetheart Dance. This will be on Valentine’s Day, Tuesday, February 14 from 9:30 -10:30 am. Families with children of all ages are welcome, and no registration is necessary. Come dance the morning away with your little sweetheart at this special event, and learn family-friendly dances and enjoy light refreshments. We hope you enjoyed getting to know your local libraries and librarians a little bit more.